DivX for Mac 7 is Mac DivX video creation & Mac DivX Player & Mac DivX Codec suite with all the tools you need to create, play DivX video files on Mac. DivX for Mac 7 includes the DivX Player, DivX Web Player, DivX Codec, DivX Converter and DivX Pro Codec support. DivX Player for Mac plays DivX Plus HD (.mkv) videos and H.264/AAC/MKV videos from the Internet. DivX for Mac sports a brand new design with translucent windows, cleaner play controls. ...... 264 (.mkv) videos with AAC audio and videos created using all previous versions of DivX technology. with DivX for Mac 7 you can also play your DivX files (.divx, .avi) on millions of DivX Certified devices today. Look for DivX Plus HD Certified devices soon that will support playback of all DivX and DivX Plus HD files, as well as .mkv (H.264/AAC) videos from the Internet. 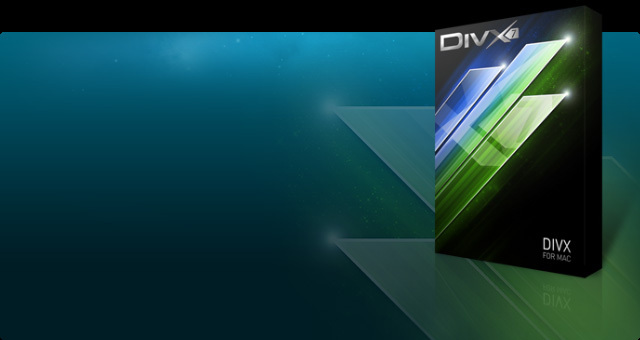 * DivX for Mac is optimized for Intel Macs OS X 10.4 & above. Using DivX Player, kick back and enjoy digital video at its finest. Optimized for both DivX and DivX Plus HD (.mkv) playback, DivX Player is the best way to experience cutting-edge digital video on your computer. Qweas is providing links to DivX for Mac 7 as a courtesy, and makes no representations regarding DivX for Mac or any other applications or any information related thereto. Any questions, complaints or claims regarding this application DivX for Mac 7 must be directed to the appropriate software vendor. You may click the publisher link of DivX for Mac on the top of this page to get more details about the vendor.